EjFord and skeazle like this. dangerdarrell and Boomer like this. wokka, dangerdarrell and EjFord like this. EjFord and samowens44 like this. EjFord and SlingLow like this. SlingLow and Ghost like this. Thanks Bill, that is helpful to have the actual recall. I want to remind folks that when you enter your vin in the the Product Safety Recall Form, it is checking for all Recall effecting your Slingshot with that Vin Number entered. I have check my a second time and Snazzy is not affected. I am glad you reminded me, I was thinking the same thing when I saw the diagram of the Brake Peddle and Master cylinder along with the pin. Looks like something we could all check. Thanks for posting that. All members, it would not hurt to do this check on yours also. View article for a clear picture of the pin in question. I received a notice of Recall from Polaris about the Seat Belt Guide Installation, Recall 18V531. I went to my Thread section on Recalls and entered my Vin, the results said it was unapplied to my Slingshot. Now, the recall letter tells you to contact the dealer for inspection and repair if needed. I will call my dealer and schedule an appointment. Do not skip the inspections as there may be something they find wrong and be able to correct. You just have a fore warning if you may or may not have the issue on your Slingshot. Don't want folks to think just because you find you are unaffected, you still need to schedule an appointment. This recall is important, Failure of the Seat belt retractor mechanism may increase the risk of injury. See if your Vin number applies. If you did not receive a Recall Notice, call your Dealer and schedule an appointment. New Owners, Helmet Laws are in effect for the Polaris Slingshot. The classification of the Slingshot has been changed in some states to a sub classification under Motorcycle, called Autocycle. The main reason for this was to get away from requiring a Motorcycle Enforcement to legally drive the Slingshot. 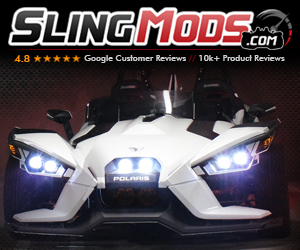 You should check your states requirements to drive your Slingshot and be within the law. Some states require Helmets and others, like Florida, do not. Most all states will require the Seat belt, you are much more safe in using both the Helmet and Seat belts. The Slingshot is not as stable as a 4 wheel vehicle and is subject to safety issues when driving on roads that are not dry and clear of debris like sand, gravel, dirt leaves and such. When the road conditions are not idea, slow down and be cautious. Hydroplaning is a condition that can be very dangerous and discussions have suspected that the ESP (Stability Control Program) may cause the condition to be more hazardous due to the nature of the braking control that the program administers. Now wear your helmet and seat belts at all times and you will have a greater safety. Enjoy your Rides! Here is some information from the NCSL about Autocycles. Edited once, last by samowens44 ( Oct 24th 2018 ). As you have your Slingshot for a while, you will start to become interested in changing the Headlights to LED. You may want to upgrade to the Canadian LED Headlights which require installing a new Headlight Assemble for model years 2017 and above. When you do this, there will be a requirement to check the Headlight Aiming to see if them are within proper limits. The new assemble will have to have your Adjusting screws moved from the existing headlight assembly to the new assembly. The adjust will not be totally correct until you meet the adjustment requirement in the Owners manual. I am showing the adjustments for Year 2017, if you have another year, check your year for proper adjustments. They should be about the same. Here are some views of comparison I made with my Upgrade to the Canadian Headlights from Stock. I did not check alignment of Headlights after the installation, but you see the LEDs fall short of going as far out as the Stock Lights. This means I needed to adjust the alignment of the new LED headlights. New owners, new information is being discussed about the subject of Canadian Headlight Conversion Kits. I will give you the thread link here to visit for some good you to view the directions you can go with this subject. Read up on the subject and then you will be able to make a better choice for what is good for you and your Slingshot. Full led Canadian Headlight compared to Stock Headlight. As you get some driving time down in your new Slingshot, you will be driving in all kinds of possible conditions. One condition that is very bad for the belt drive system of the Slingshot is Dirt! Dirt roads are great for producing a fine dust that will accumulate on the belt and pulleys. When the dirt gets compressed into a glaze, you may experience noise in the way of squeals as you accelerate and let off on the gas. Here is a thread that one of our new owners created for help with his noise. The moral of the Story and ending line is Soap and water and cleaning will solve a lot of noise problems. Keep your belt and pulleys free of dirt build up for peace and quiet. Take a look at the thread for the discussion from start to finish. Be aware, Belt Alignment, Belt Tension, and the pulleys can be a part of the problem. Cleaning is the First Step in Noise control from the belt drive system. This will show a good example of how our experienced members will come to the aid of anyone with an issue. Now, folks some of our members have a sense of humor and will sometime play down a question as maybe you should know that. Most all of us realize that a lot of new owners do not have a lot of experience with the techs of vehicles and are truly looking for answers, please don't feel you will be asking a stupid question, some of our members are so skilled they may not be able to reach to the lower levels of knowledge. I Believe there are most of us that can work with knowledge base from flat bottom to the high reaches. You can feel comfortable asking any question of your concern. Welcome and we want to help you enjoy your Slingshot. Edited 3 times, last by samowens44 ( Nov 1st 2018 ). New Members, Owners, and Guest, Our Website Forum has a Calendar with photos of our Members Slingshots Feature on spaces around the Calendar. They are really great looking and a way of showing off some of the hard work that our member put into making their Slingshots Awesome for a Calendar Position. I am posting a Link to the Official Calendar Thread for the ordering information. Also will show how our 2018 Calendar looks for November. Join our Website and your Slingshot could be on a Calendar for Next year. Order your Calendar before Dec 1st and you pay only $25, after that, the price goes to $30. Worth that easy. Click on More at the bottom of the Clock counting down for all the ordering information. You can submit Photos of your Slingshot to Ross and he will consider the resolution and overall quality of the photo to be a part of next years calendar. The Larger the Resolution and good composition, you stand to occupy a spot as a cover photo for a month. If you go to the Thread Post link I listed above, you can look through the thread and Ross will give you the resolution and size of photo that can be produced. If you have questions, he can answer. 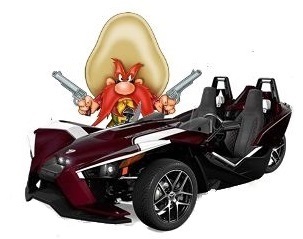 New Owners, you may have just bought a new Slingshot, it may be used and come from Canada or some other country where the Odometer Display is in Metric. It could have been changed in error of trying to make other setting changes to the display. Here is how you can Change that display to the Standard setting or if you need, go to Metric. Check your Owners Manual for the Mode Switch Instructions and you will find this. By the way Polaris calls this a Multi-Function Display. This is important to know in that if you just get into the Slingshot Turn the key on and before the display has displayed anything displayed and you quickly depress the Mode switch to clear Trip A or B, you will enter the Change Display main settings for Standard or Metric. This may be why people are getting their settings messed up when they did not intend to change the Main Setting Standards. This is why they have you go through the special procedure of turning ignition off then on and quickly depress and hold Mode button. Now you know. Edited 4 times, last by samowens44 ( Nov 25th 2018 ). For the folks that are thinking of mounting a GPS on your Slingshot, here is an answer for the Sun Glare that you will get on the screen, making it impossible or hard to view. Take a look at my GPS Sun Shade I created to make your Screen more view-able. As New Owners get use to their New Slingshot, one thing will come to light of importance. In States that Helmets are required, Helmet Intercom System will be nice add for communicating with your Passenger with comfort and understand. Gail and I use the Sena SMH 10 system. Works really great and we have had it for about 3 years. You can hook up with three other Riders, making for communications between Slingshots. Price range is around $250. Here is my video showing demonstrations. I am using a mic to capture the sound from the ear piece in my helmet. Does not show the real clarity we get. This is a subject that will come to mind at some time in your Ownership of a Polaris Slingshot. This is for members with Slingshots prior to Ride Command System. The Entertainment System of the Slingshot has some basic features that work well. The FM/AM Radio is not one of them. A lot of owners want to take photos while they ride in group rides. They also want to hear music of a great selection to fit their ride mood. They want GPS to help with navigation. They would like to have a 7" display screen with a sharp image for viewing in the daylight. I hear you and have been where you are trying to get. The Ipad and GoPro can fit the bill. Along with an Internet Hot Spot Connection to the Internet for driving conditions. My videos below will outline the steps needed to help you achieve all of these desires for your Slingshot Experience. Important information: The GoPro and Ipad Connection will provide a driving view of the Road, when camera is in the rear direction, do not use the view for Driving decisions. The view is confusing as the image is not in reverse view as real backup cameras are displayed. Use this feature for Photography only! To help with Bluetooth Connecting the Ipad to the Slingshot Entertainment System, video on how to connect to the Iphone. The procedure is the same. The procedure is in your Owners Manual for reference. This will help with the Ipad Connection to the Entertainments System. Good Luck member. As you get use to your Slingshot, you will discover you can not judge distance from the wheel Curb on Passenger side wheel when parking. I did post earlier in this thread about angle parking at curbs when parking parallel to curb. When you install the Ipad and Gopro, here is another way of viewing the Passenger front wheel distance to the curb. Uses the same connection to Wifi as before in above post. There are other camera positions that will make this a useful addition to your driving experience. I point out a few in the video. Folks, I am very bad about riding with my turn signal still on due to small radius turns. In the Car, there is a clicking sound that my passenger will alert me to the fact. The Slingshot has no clicking and I don't think you could hear it with the wind noise. The indicators lamps on the Instrument Panel does not get your attention as they are way down from your driving view. I mounted two small LED Lamps on the dash over the Entertainment System location for attention. It did not work. Too far out of driving view. Oznium has some ultra thin bright LED Strips that really are bright that will stick to surfaces very good. I took a 35 in strip with two connecting ends and cut at the cutting point of 15 LEDs on both ends. I attached these strips to the Driver Side Rear View Mirror support Arm with the adhesive strips. I wired the black lead to ground and the red lead to the blue wire pin 1 on the Turn Signal Lead for Driver side, and the red Lead from passenger side to the Blue with pink strip pin 1 at the Passenger side Turn Signal Plug lead. I found I need to add 75 to 100 ohms of resistance in the circult as the LEDs drew too much current and will trip the circuit breaker for the turn signals. I could not find a resistor, and had two relays that had 75 ohm coil resistance. I wired the coils into the circuit wiring and all is working great. You do not use the contacts of the relay only the coil for resistance. If you can get a 75 to 100 ohm resistor then use it. This works great for me as both indicator lams are right were they get my eye attention and can manually cancel when needed quickly. Good Luck. Find some way not to drive with your turn signals on, I see lots of guys Slingshots doing it. If you have a indicator on the far right mirror area you may not see it while driving, that is why I mounted mine on the driver side. I have had the Aux LED Turn Signal Indicators installed on Snazzy for a couple of months. I did a review video to show how well they light up and are in your line of sight mounted on the Driver Rear View Mirror Arm. I strongly recommend installing an Aux Turn Signal Indicator in the line of sight to give warning when your Signal did not cancel from a turn. I have found having both indicators, left and right together works best. Good luck and keep safe. Note: I did find a place to order 75 ohm resistors that are necessary for the LEDs to blink. In my installation video, I used two relays that had the correct resistance, order the resistors from Ebay and install in series with each of the leads to the turn signal leads. It is located in the video half way. For the folks that don't own a Slingshot, here is why you may want one. A ride for lunch becomes a real adventure. You experience a really good feeling as you ride and look at that great view through the low windshield. We love the view you get without the optional top a lot of folks opt for. You will get great comments and looks as you travel and make stops for gas. Here is a view of one of our rides on Easter Sunday. Went to St Augustine, Fl for lunch and look around. As we are leaving, I captured the view of some of the area. Full of things to see and do.